Raven Rock is moving closer all the time to our covered arena, though this year the weather has given us many days of sunshine and songbirds (LUCKILY!) The county is our hold up (what a surprise!) And we will have battles to wage on that front. All of the other “ducks” are in a row, so let’s hope that the county will see the need and the service we provide and allow us to get started. One of the coolest things that has happened in a long time is that we were featured in a piece on our local Evening Magazine TV show. I am attaching the 3-minute segment, so please watch it. The crew was professional and so GOOD at their work! I am very pleased with the result. A special thanks to Michael King, the interviewer, who first contacted me and kept after it until this feature was done. Check it out! I think the most touching part of the story was not told in the Evening Magazine piece. The day after it aired, Kaylee’s teacher showed the piece, with Kaylee’s permission, to the rest of her classmates. Think for a moment how courageous this was for Kaylee. It exposed her to her friends and foes at school (she suffers from bullying there). It was an amazing step of bravery. Moreover, her teacher asked the teary-eyed kids who watched the video, “Who among you would have been brave enough to say those things on TV?” Not one hand went up. But when they came around Kaylee, supporting her, they were able to open up and tell their own stories. Many stories came out of the darkness that day. Many children were set free from the prison of their shame and fear of having their troubles exposed. It was OK for them to share, because someone who did not seem brave was able to do it with a confidence they had not seen in their classmate before. The light shined in their darkness and, I hope, began a journey of healing for each of them. Though the raw numbers of children who come to RRR are not high, our success rate is off the charts. When you consider the entire family of 5 who benefits when their child stops attacking the siblings, or the many classmates of Kaylee’s who have been helped, the numbers go from helping dozens of people to hundreds every year. So I often feel it is misleading to state the number of kids we help- for that number is so much larger than those who come through our gates. I hope there is even something in this report that might help encourage you, too. Raven Rock Ranch is beginning a new service for our parents. We will have a parent group every 4th Saturday morning of the month from 10:00-11:30. We have such of wealth of experience and knowledge among our parents, and we have so many who have questions and challenges that need answers, it will be a perfect combination. I will lead it and we will discuss topics, answer questions and eventually get into the round pen with a horse. It is so valuable to experience what your child is experiencing- that alone will answer many questions! We have many parents who would truly enjoy the time with a horse, too. As always, we look forward to the many things coming up at RRR. In April, we will host a Personal Growth Workshop given by HEAL team Leigh Shambo and Kristin Fernald. This is a requirement for the Facilitator training that will be here at the ranch in May. 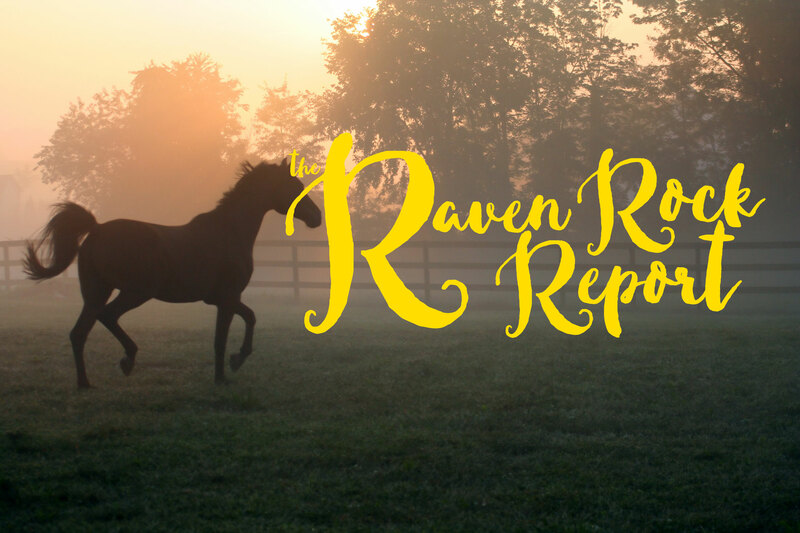 We are so excited to have this esteemed team working closely with us in developing our program here at Raven Rock Ranch. We have hired a grant writer. Hertlein Grant Writing is a local group that has many of the fundraising skills that Raven Rock is now mature enough to use. I am so glad to welcome them into the Raven Rock family. I feel like we are all working together so diligently to improve the lives of kids, families and horses. We know it works so well. We just need to broaden our reach into the community to make an increased impact. Our staff and Board are all so dedicated to this vision. We know that you are committed to bettering kids’ lives, too, because you read the newsletter every month, send your financial support and many of you pitch in and help. We are truly blessed to have a great bunch of supporters as you! We ask for your support financially, physically, but most of all, prayerfully. Your prayers are the most important thing to our organization! Thanks for your faithfulness. You know that lives are changing because of you!